As the mother of 3 sons, I often say "The world revolves around families of 4". Thankfully this is not true at Walt Disney World. 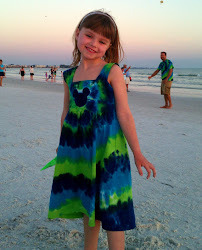 There are a number of accommodations in multiple price ranges for larger families and even families traveling together. It is important to note that all room occupancy limits do not include one child/infant under the age of 3 in a crib or port-a-crib. All Star Music has "Family Suites" that include a Kitchenette, separate Master Bedroom and bath, and sleep up to 6, plus an infant. In Summer 2012 the new Value Resort the"Art of Disney Animation Resort" will open which will be primarily larger 2 bedroom"Family Suites"that will sleep up to 6, plus an infant. 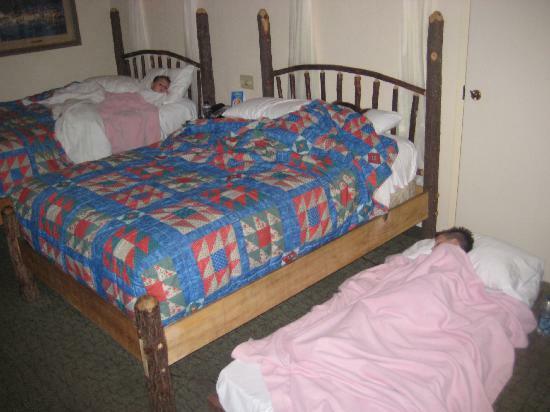 Port Orleans Riverside has rooms available that have a trundle bed and can sleep up to 5, plus an infant. Fort Wilderness has campsites, as well as cabins that sleep up to 6, plus an infant. The cabins have a full kitchen, separate bedroom, and a Murphy bed. Several of the Deluxe Resorts including The Contemporary, The Polynesian, and The Grand Floridian have rooms with 2 queen beds and a day bed which sleep up to 5, plus an infant. Disney Deluxe Villas are available from the Central Reservations Office, as well as for rent from Disney Vacation Club members , and have rooms that sleep up to 12 guests, plus an infant! 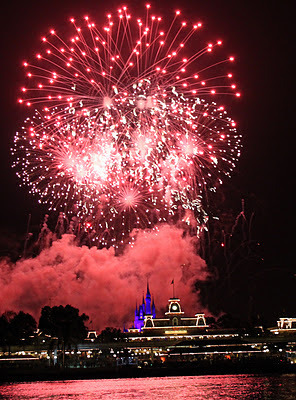 REMEMBER -It is standard practice at many hotels, including Disney to tack on an additional room charge per night for each adult after the first 2. Depending on your party size, this may or may not affect you. Disney's Value and Moderate Resorts do have available connecting rooms. Two connecting rooms at an All Star Resort can cost as low as $170/night plus tax, and sleep up to a family of 8 people. While not the most luxurious, this is the cheapest way to sleep 6 or more people on property. It is important to know that although you can request adjoining rooms, this is a request only, and Disney will not guarantee that you will receive the adjoining rooms upon check-in. You may get there and find there are no more adjoining rooms available, so no Donald Duck style temper tantrums if you don't get it. For a slight step up, ($195/night plus tax in the off season) you can book a Family Suite, which is currently available only at All Star Music. This room sleeps 6 with a separate master bedroom and bath, and a kitchenette. Although it is a little bit more costly, having a kitchenette with a microwave and mini-fridge can save you a bundle on meals, drinks, and snacks. If you are relying on Disney transportation, there are even grocery services that will deliver to your resort! Coming in phases in 2012, and available to book now, is Disney's new Art of Animation Resort. 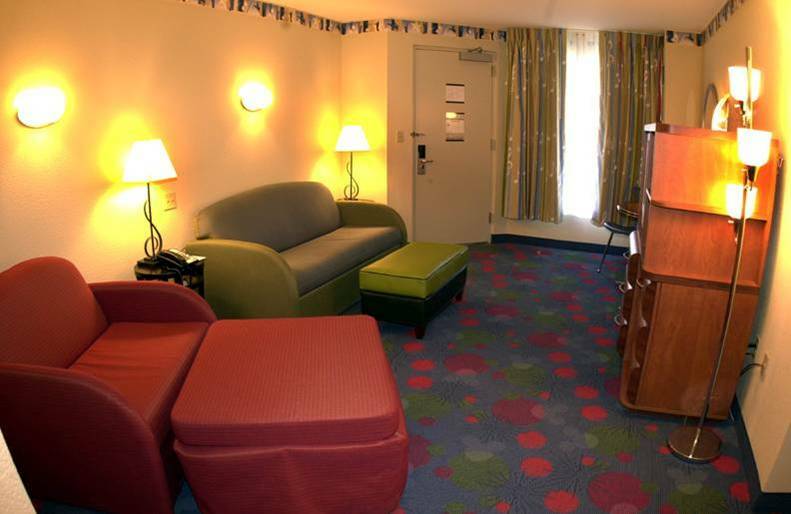 While there will be standard rooms available, the majority are going to be family suites. They will be larger than All Star Music, with three separate sleeping areas including a master bedroom and bathroom, a kitchenette, and will also sleep up to 6. As these will be newer and slightly more deluxe than the All Stars, they come with a slightly more deluxe price, starting at $249/night plus tax in the off season. 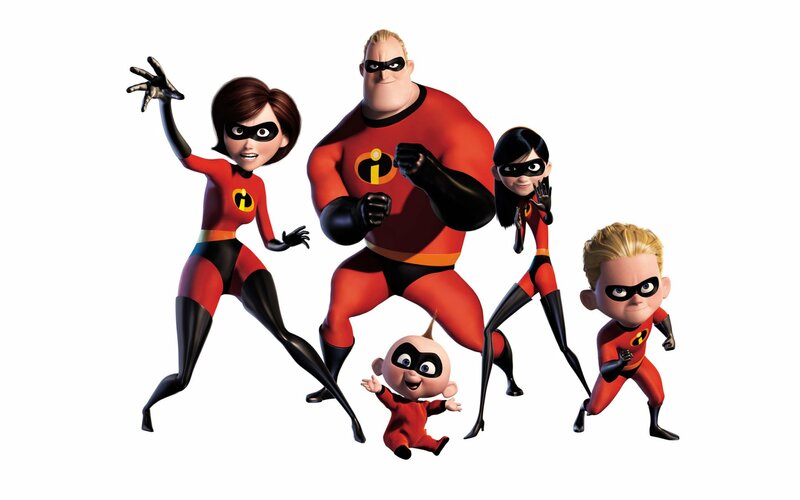 For a family of 5, the least expensive option is Disney's Port Orleans Resort-Riverside. The rooms in the Alligator Bayou section of the resort are standard rooms that come equipped with a hidden secret, a trundle bed! While not a big bed, and certainly not a comfy place for your tall teenager, it is a small and comfy sleeping area for a smaller child. These rooms are slightly larger than a value, and do come with a mini-fridge. The quarters are a little tight for 5 people, but it is a wonderful value for a family of 5. The resort itself is beautiful with lush gardens and fabulous pools, and is often considered the best of the Moderate Resorts. I usually recommend this resort over the other moderates regardless of if you need the trundle bed or not. Fort Wilderness has campsites and cabins available for those who want to get away from it all. Campsites are inexpensive and include a picnic table and charcoal grill. More deluxe sites are available with RV hookups. There are air conditioned comfort stations with private showers, bathrooms, and laundry services scattered throughout the campground. 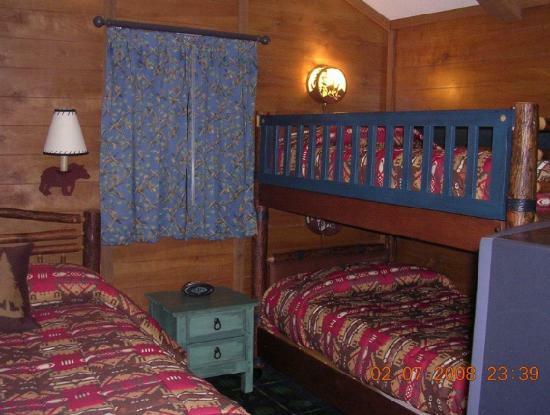 Cabins are basically trailer homes that have been modified by the Disney Imagineers to resemble a cabin in the woods. They have a separate bedroom with a queen bed and bunk beds, and a Murphy bed in the main living area, for a total sleeping capacity of 6. There is also a full kitchen, a charcoal grill, a deck. The bus routes can be a bit circuitous, but you do get a full kitchen, more space, and lots of activities on site including horse back riding, canoes, and s'mores campfires with Chip and Dale. If you have the budget, most of the Deluxe Resorts have the capacity to sleep 5 in standard rooms. The Contemporary, The Polynesian, and The Grand Floridian for example have rooms with two queen beds and a day bed. Of course these resorts also have spacious suites available. 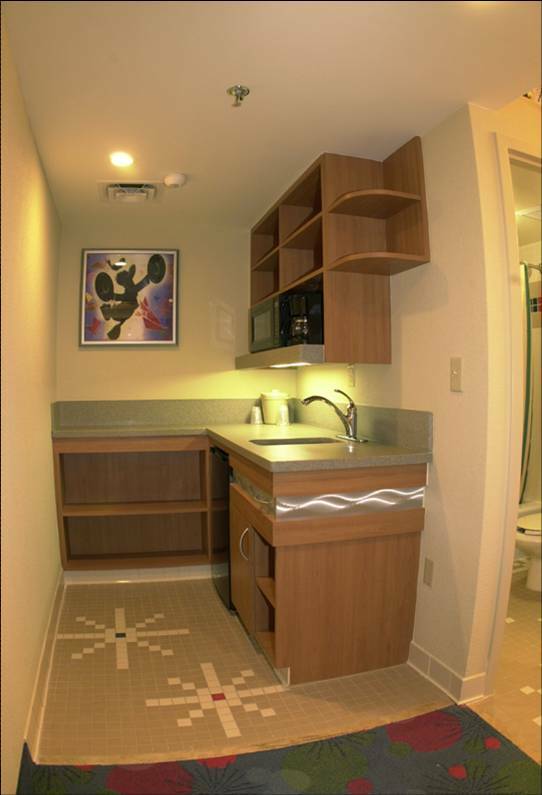 A 1br Standard View room (looks at pool or parking lot) at Animal Kingdom Villas that sleeps 5 with 2 bathrooms and a full kitchen in early February for Thursday- Monday will cost you $2240 including tax. If you rent the points needed from Dave, your cost is $1456 for a savings of $784! A 2br Villa Disney's Old Key West Resort in September, that sleeps 9 and has 2 bathrooms, 2 bedrooms and a full kitchen will cost you $4664 including tax if you book through Disney. This exact same room you can get by renting points from Dave for $2834 at a savings of $1830. Depending on the season, you may save more or less. Because the DVC point rental season is not identical to Disney's cash seasons, you will sometimes only save a few hundred dollars with rental, but that's still great money! If you have 4 adults sharing a room, All Star Movies in early December will cost you $1170 for the week due to the extra charge for 2 additional adults. If you rent points at $13 a point, your cost is only around $1000 and you get a kitchenette, better pools and a more deluxe resort! If you are trying to decide what the most cost effective deal is for you, email me and I'll help you figure it out!